(Leah Hogsten | The Salt Lake Tribune) Students watch as their handmade paper rockets are launched to learn about aerodynamics in relation to drag and thrust as they watch the rocket's trajectory at a "Rocket Science" workshop at SheTech Explorer Day for high school girls to learn and explore the world of science and math including coding, robotics, building circuits, diamond butting, artificial intelligence and virtual reality at the Mountain America Expo Center in Sandy, Wednesday, Feb. 28, 2018. 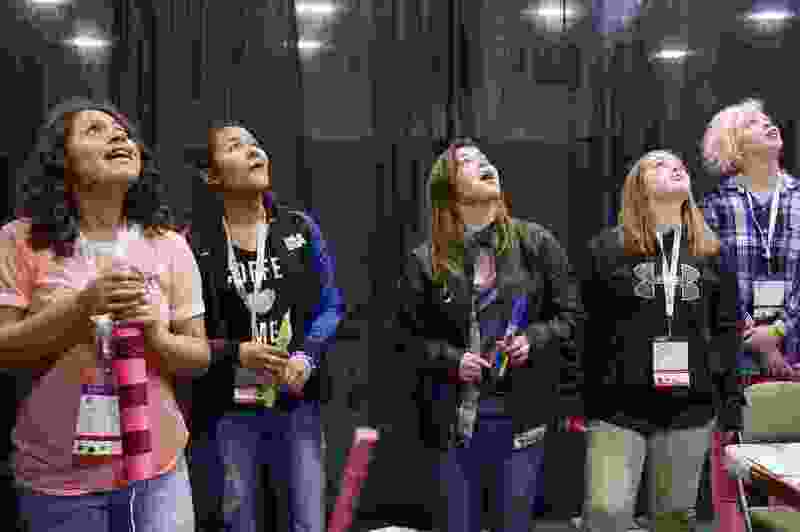 More than 2,000 teenage girls gathered in Sandy on Thursday to explore opportunities in fields related to tech at the annual SheTech Explorer Day convention. More than 100 private-sector tech companies were on hand to explain and inspire at the massive convention, including Dealertrack, Cox Automotive, Domo, Ivanti, Adobe, Ancestry.com, AT&T, Dell EMC and Vivint Smart Home. Those are household names in Utah. Opportunities to meet successful women who work in tech can act as a catalyst for similar success. Young women who go to college already having an interest in careers in tech and other STEM (science, technology, engineering and mathematics) fields will be more likely to join those fields after graduation. As it is, women account for only 23.5 percent of Utah’s tech force, slightly less than the 28 percent national average. SheTech is only one program designed to attract young women to STEM field occupations. Last week the founder of Girls Who Code, Reshma Saujani, visited Utah and announced the creation of more than 50 Girls Who Code clubs across Utah. Private companies and education are on board. Now we just need the Utah Legislature. Many tech companies in Utah are small and entrepreneurial, and, for companies with fewer than 15 employees, these young women would not be protected against workplace sexual harassment or discrimination. That’s because this week the Legislature voted against a bill that would have provided such protections, including protection against retaliation for objecting to harassment or discrimination. Employees at companies with more than 15 employees enjoy these protections. The arbitrary cutoff of 15 employees makes little sense. Utah’s tech industry is nationally recognized and is helping Utah emerge as a leader. We even have our own moniker, Utah’s own Silicon Valley — Silicon Slopes. We need to prepare for our young women to join these efforts, and that preparation includes ensuring they are treated equally and professionally. The Legislature needs to modernize to keep up with Utah’s tech.